The Motorola A780 is a novel Smartphone device running Linux and Java, with a large 240x320 pixel display and a novel clamshell design for maximum ease of use. The main display is touch-sensitive and can be operated with a stylus. Fold down the lid and you get a fairly conventional keypad. On the back is a 1.3 megapixel camera, and the A780 features quad band GSM, GPRS and EDGE high-speed data, and also takes TransFlash removable memory cards - but sadly only up to 48Mb which isn't even enough for a standard CD's worth of MP3s. Media playback is a strong feature on the Motorola A780, with support for MP3s, RealAudio, AAC files and other formats, plus video recording and playback. But the A780 isn't just a media device, it also has WAP, XHTML and HTML browser support (using the Opera web browser), email capabilities via POP3/IMAP4/SMTP, instant messaging, SMS and MMS. And in additional to all that, you can view PDF (Adobe Acrobat) and Microsoft Word, Excel and PowerPoint documents. Like the Similar Motorola E680, the A780 has 3D graphics support, and that big 240x320 pixel display looks tempting for games. Look at the A780 as a rival to the Sony Ericsson P900/P910 and you'll understand the market segment the A780 is driving at. But this packs several features that the P900 and P910 do not, such as EDGE and a megapixel-class camera, and the keypad arrangement looks more robust too. 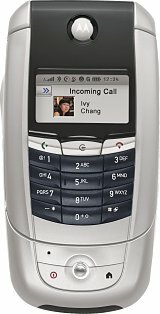 Indeed, in hardware terms the A780 easily beats the Sony Ericsson (apart from the P910's dinky QWERTY keypad) - however, there's a wealth of Symbian software around that simply isn't available on this Linux platform. Motorola are saying that the A780 will be available in the fourth quarter of 2004. We think that it might be later than that, and probably not available until early 2005, based on Motorola's past performance. Like many other recent Motorolas, the A780 is a fantastic phone that will have the competition seriously worried, although we doubt that Motorola can bring it to market in a timely fashion, and 48Mb memory is simply not enough and hopefully this can be fixed. If they can make a decent range of software available for this platform, then there's the very real possibility of another Smartphone choice other than Microsoft or Symbian, which is our view is a very good thing. Prices are to be confirmed, but our guess is that the unsubsidised launch price will be about �900/�550/$1000.